10-in-1 Multifunctional Tool Set:This Multitool Knife With Large Knife Blade, Needle Nose Pliers,Mini Wood Saw,,Bottle Opener, Phillips Head Screwdriver,Metal File,Wire Cutter, Medium Slotted Screwdriver,Large Slotted Screwdriver,Rope Cutter. Ergonomic Design and Locking Mechanism Guarantee: This Multitool Knife Pliers Tool Applied German Ergonomic Design,More Comfortable During Operated. Safeguard Prevents the Blade from Accidentally Closing. 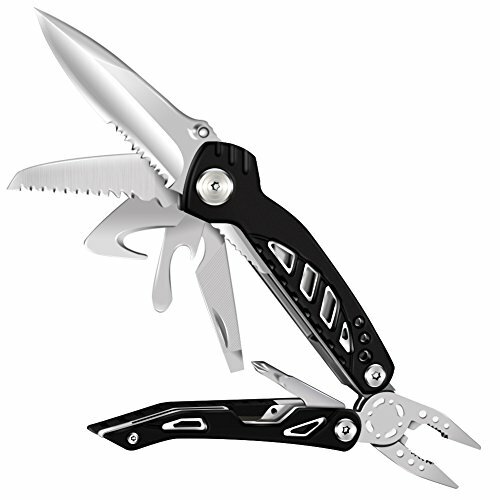 Durable Nylon Sheath for Easy Carry: Pocket Multi Tool Set With Durable Nylon Sheath, Compact and Lightweight, Easy for Carrying When you go Out. Lifetime Guarantee: We Offer Lifetime Warranty and No Reason Return Policy. If you have any questions about this product by pohaku, contact us by completing and submitting the form below. If you are looking for a specif part number, please include it with your message.